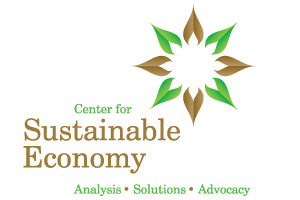 Center for Sustainable Economy is a leader in the transition to a just and sustainable economy. We do this by holding decision-makers accountable for building the New Economy and not just perpetuating business as usual. We are lean and effective, but need support from indiviudal donors to be able to continue our public interest economics work, maintain tools like our ecological footprint quiz and promote the genuine progress indicator. Please support our efforts with a generous donation. Small non-profit individual quiz license. Med non-profit business quiz license. CENTER FOR SUSTAINABLE ECONOMY has partnered with Network for Good to securely process your online credit card payment via Network for Good (tax ID 68-0480736). This transaction will appear on your credit card statement as "Network for Good." This transaction is subject to Network for Good’s Privacy, Security & Disclosure Statement and the Charitable Solicitation Disclosure.